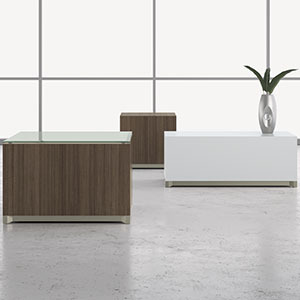 Epic delivers a clean design, balancing wood or laminate with the cool touch of metal. Epic offers a distinct look that exudes a contemporary vibe from private office and conference settings to café and learning spaces. Epic delivers a clean design, balancing wood or laminate with the cool touch of metal. Epic offers a distinct look that exudes a contemporary vibe from private office and conference settings to café and learning spaces. The information contained in this site was provided by the producer and/or certifier and we endeavor to keep the information up to date and correct. ecomedes make no representations or warranties of any kind, express or implied, about the completeness or availability of the product information on the site for any purpose. We encourage users to contact the producer or certifier directly for additional details. It’s important to note that no products individually or collectively, can guarantee a specific number of points for LEED, WELL, GreenGlobes or LBC certifications.